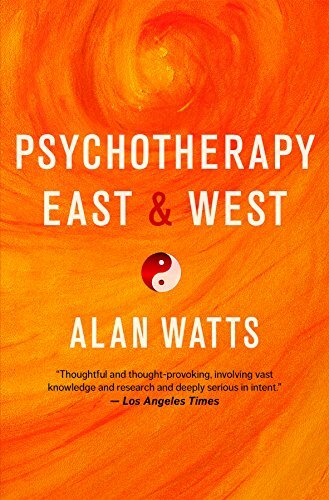 Psychotherapy East & West by Philosopher Alan Watts was first introduced to us in 1961 and has been recently reissued by New World Library. In this seminal book, Watts provides an extensive analysis on the Western practice of psychotherapy and Eastern philosophies of Buddhism, Vedanta, Yoga and Taoism in regards to liberation and the results of social institutions on the self. Watts begins in Psychotherapy and Liberation by outright stating the similarities between psychotherapy and eastern philosophies: "Psychotherapy and ways of liberation have two things in common: first, the transformation of consciousness, of the inner feeling of one's own existence; and second, the release of the individual from forms of conditioning imposed upon him by social institutions. "(11) But, as Watts develops throughout his work, psychotherapy does not quite hit the mark in terms of seeking true liberation, but it does aid in the individuals adjustment to social norms. Eastern philosophies, he argues, offers true liberation because they are more focused on the self and reflection. Western psychotherapy, on the other hand, is useful in terms of coping with societal impacts and institutions, but the treatment only goes so far. All through the chapter, "Society and Sanity," Watts addresses the idea of society and how it affects the practice of psychotherapy. He also highlights how society also poses influences on eastern philosophies. He begins his comparison by stating, "Thus the whole difficulty of both psychotherapy and liberation is that the problems which they address lie in the social institutions in whose terms we think and act. "(38) In saying this, the techniques used in western psychotherapy and eastern philosophies are central in coping with the influences of social institutions, but eastern philosophies contribute to more than just social adjustment. He inquires the issues of human interactions and lifestyles, while also questioning the social norms humans bind themselves to that may ultimately lead them to a false sense of liberation. In the chapter entitled "The Ways of Liberation," Watts clarifies within his argument that it is okay to almost take ideas from other cultures and adjust them to our own lifestyle. He asserts, "In this way we can borrow things from other cultures, but always only to the extent that they suit our own needs. "(44) In saying this, Watts offers a more advanced view of extracting what one needs from a religion and philosophy, maybe not acquiring the entire ideology into one's life, and then using it to improve one's sense of liberation to the fullest. Watts pushes a couple of arguments throughout this chapter. One, the individual in search of liberation must find liberation by his or herself, not by the hands of another. Two, the individual may be guided by an instructor or mentor that allows the individual to act on their own motives free from societal intervention, but not in pair with another individual. Watts begins to address how the individual will reach enlightenment in chapter, "Through a Glass Darkly. "He believes that an individual must address the hardships in life to better recognize his or herself. The goal is to truly understand oneself completely in order to fully liberate the ego. Watts continues, "Can psychotherapy complete the job? In almost all its forms it has one enormous asset: the realization that escape is no answer, that the shudders, horrors, and depressions in which "the problem of life" is manifested must be explored and their roots felt out." (94) One must accept and comprehend the difficulties one has experienced throughout life and let go the feelings of despair and pain. There must be a means to the end, as Watts justifies, "...without ulterior motive and second thought, makes us feel guilty...You must have a reason for what you do!" (102) We attend events or participate in an action for a result, whether it be to improve upon ourselves or to obtain a certain goal. There is a cause and effect system that we get roped into that may distract us from true realization. One major assertion Watts contributes to the field is the recognition of immense similarities between Buddhism, Taosim, Vedanta, and Yoga to Western psychotherapy. Before this time in 1961, the idea of the alikeness between these styles of practices was overlooked. Watts establishes a riveting and credible perspective that provides a new avenue for conversation in the text of identifying the countercultural alikeness between eastern and western ideologies. His work provided a monumental shift in thought of how we should view liberation, society, and the ego in regards to both Western and Eastern philosophies. Fundamentally, Watts' book is a credible, insightful, and timeless work that provides sound assertions in regards to similarities of both Western and Eastern psychotherapy and philosophies. This book serves as a sound resource for those studying religion, philosophy, and even anthropology, in modernity and antiquity. Gabrielle Sinnott is a Junior in the History & Political Science program with minors in Philosophy & Medical Humanities at Daemen College, Amherst, NY. She is the President of the Honors Program as well as a Trustee Scholar.